Construction of the largest and most powerful camera in the world just secured the funding needed to be completed on schedule, thanks to a grant they received from the National Science Foundation. On schedule is still very relative, as the Large Synoptic Survey Telescope (LSST) is not scheduled to be completed until sometime in 2022. The LSST is one of the current project being worked on by the Department of Energy’s Stanford Linear Accelerator Center (SLAC) laboratory. This isn’t SLAC’s first record-setting camera, they previously have built one of the world’s fastest shooting cameras as well. While SLAC is building the LSST, it will not be at Stanford, it will be located on top of Cerro Pachon, in Chile. You might be wondering, just how big is it LSST? First off, the LSST is the whole telescope, which is an 8.4 meter ground-based telescope. The camera at the heart of it will be about the size of a VW Beetle and will weigh about 2,800 kilograms; which, for reference, is the weight of four VW Beetles. The camera is equipped with an innovative triple-lens design, a 64cm diameter array of 16 megapixel silicon detectors will comprise the 3,200 megapixel (3.2 gigapixel) sensor which is what takes all the shots. This gives the LSST to have an extraordinarily wide field of view, which, paired with its double 15-second exposures, will give the LSST unprecedented abilities in its decade-long survey of the Southern sky. The LSST will generate roughly 200,000 extremely detailed images every night (about 20 terabytes of data). 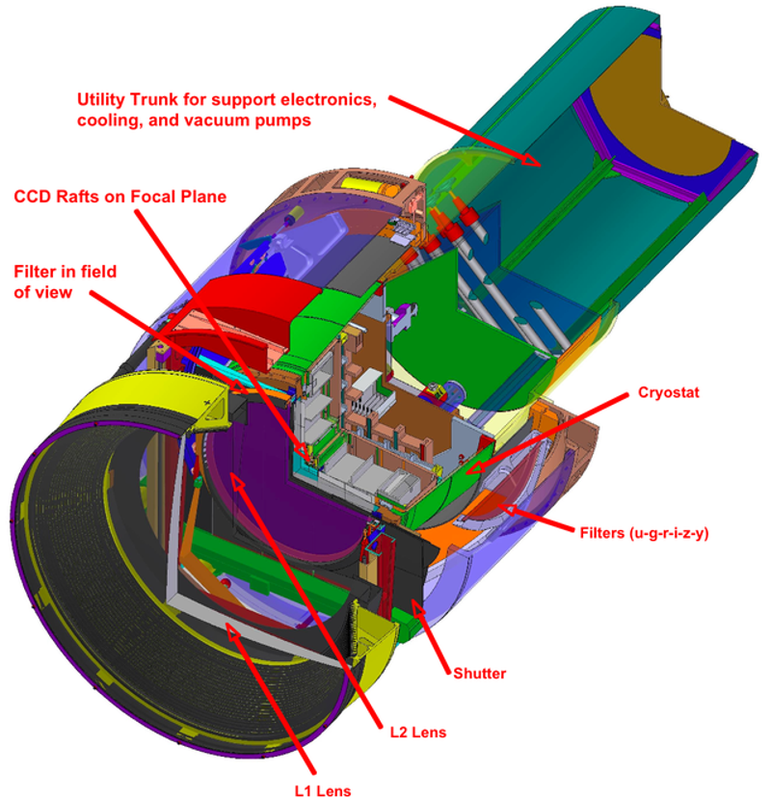 Diagram of the LSST’s camera. For comparison, the camera with the most megapixels in the world is a Canon, which boasts 120 megapixels and it is not available on the consumer market. For the curious, the most powerful smartphone camera is a Nokia, rocking a boosted up 41 megapixels. The LSST is equivalent to the power of 26 of those Canons combined, or 78 of those Nokia phones. It would take the combined megapixels from every camera phone and i-Pad blocking my view at the last concert I went to in order to get anywhere near the LSST. For those technically in the know, megapixels aren’t all that matters and more megapixels will not always make for better photos. The quality of the camera’s sensor is essential to taking good shots, and currently for consumer cameras, CMOS is winning out against CCD sensors. From the sound of it, the LSST uses something totally different, which is very exciting. I can’t wait for the consumer market to be able to use these new technologies for faster shooting, more powerful cameras, with obscene amounts of storage space.